Bill and Jane Clark on their 50th Anniversary. In 1970, because of the population growth south of Washington D.C. along the I-95 corridor, and the growth in new housing in Dale City, Virginia, representatives of Washington City Presbytery (UPUSA) and Potomac Presbytery (PCUS) (later to become joined as National Capital Presbytery), worked together to develop a new church, which was to become their first union church. They called Rev. William N. Clark to grow and lead the flock. 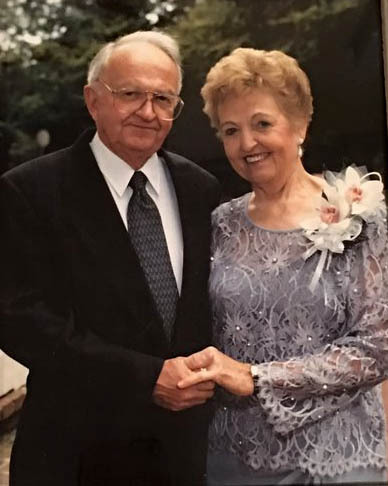 Bill (as he was always affectionately known) along with the support of his wife Jane, started the church in their home in Dale City in September 1970. Rev. Clark began the church with one guiding principle – that the church would be welcoming to all those who believed in Jesus, irrespective of their race, ethnicity or previous church background. The church was officially chartered as the First United Presbyterian Church of Dale City (FUPCDC) on April 16, 1972. The name was chosen by the congregation because it described the real spirit of unity within the church. That unity of faith came from members who hailed from 26 states as well as England and Scotland with 14 confessions of faith and 26 reaffirmations. As the numbers grew, the congregation moved to Dale City Elementary School and later to, what was, Godwin Middle School and is now Hampton Middle School. The challenge of meeting in schools was that, in order to conduct worship, everything had to be brought to the school each Sunday: Bibles, hymnals, Sunday school items, coffee, etc. Another challenge was to get folks to understand that the church is not necessarily a building, but a community of believers. However, it soon became evident that a church building would be needed. A Building Committee was authorized in the summer of 1975 and a six-acre church site was chosen along Minnieville Road in Dale City. The ground breaking was held in January 1977 with completion of the building in December 1977.